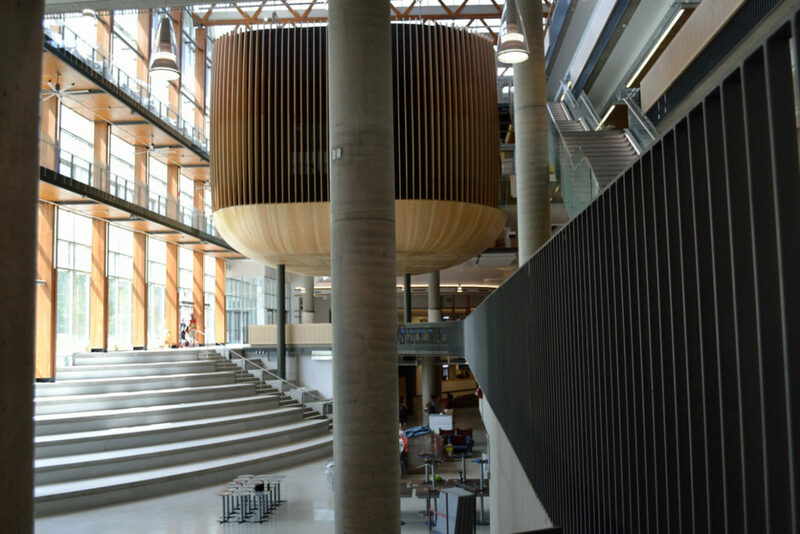 Recently opened at the University of British Columbia in Vancouver, the new Student Union Building, or Nest, as it is now known, is a joint venture in architecture between DIALOG and B+H architects with Joost Bakker as the principal-in-charge for DIALOG. Andrew Larigakis was project architect and began on the project at its earliest conception while at DIALOG and saw the project through to completion working from his own studio. With a diverse program that includes the student government Forum, radio station, newspaper, theatre, art gallery, food outlets, market, and the home for over 300 clubs, the new SUB is a city in miniature. The design is strongly orientated towards community-making and has ambitious sustainability goals making this project a microcosm of a new kind of city. Like an Italian hill town, the life of the community is spread over multiple levels with strong visual and spatial connections throughout bringing energy, vitality and a unique theatricality to the whole. Energy efficiency is prioritized, rainwater is harvested and a closed-loop model of food production and consumption is posited as part of an overall vision for an environmentally and socially sustainable community. The SUB project was envisioned, directed, largely paid for, and now operated by UBC students through their Alma Mater Society; the AMS is a unique body independent of University administration that looks after student affairs and also includes numerous student-run businesses. Student leadership was key to the ambitious and unconventional approach taken for this building which is unlike anything else on the campus. The new SUB is designed to be very open and inviting, particularly at the ground level where multiple entrances facing all directions integrate the building with its site and the numerous pathways that transect it. The open, bright and welcoming building is a contrast to the bunker-like old Student Union Building opened in 1967 as a student bastion against a perceived enemy administration out to crush student revolt at the time. Remnants of that previous era are, however, incorporated into the new SUB which, on its west side, incorporates UBC’s famous grassy hillock, the Knoll. The Knoll has been a focus for student activities, including protests, since the 1960s and remains an important element of UBC’s history and identity. On the tightly constrained site, the Knoll is bisected by the new building but extends into the interior atrium as a curved and terraced seating area. The interior knoll is an additional place for large student gatherings and a focus of the main atrium space around which much of the building life revolves. 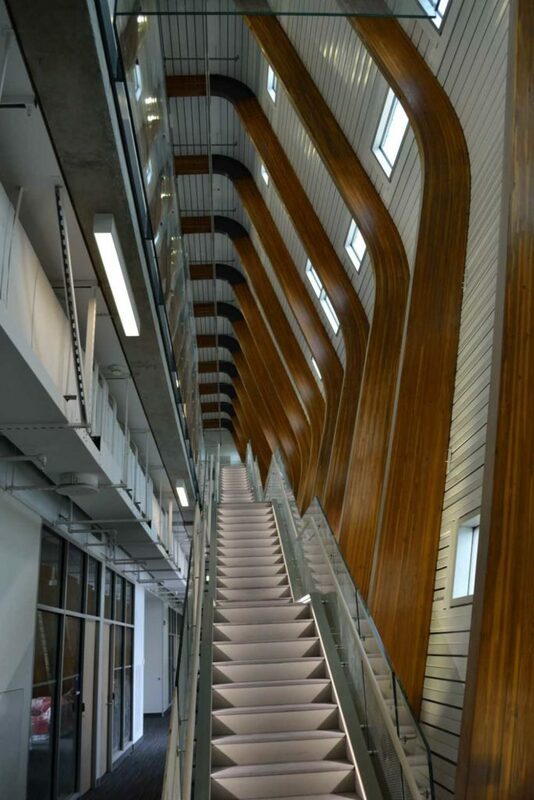 Along with its multiple ground level entries, movement through, around and up the building is encouraged and celebrated by a series of staircases, including the dominant main stair, and by bridges, open corridors and axial views. The experience of time is embedded in the building design both through the choreographed movement of occupants as well as through a conception of building elements that acknowledges inevitable changes throughout the SUB’s lifespan. 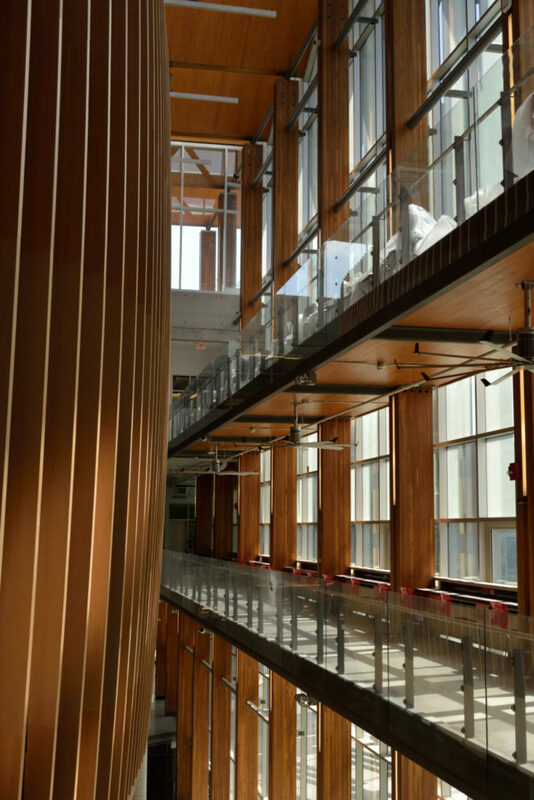 Certain elements, like stair cores, columns and slabs are viewed as permanent for the life of the building while others, like partition walls, electrical and mechanical services are designed for easy adaptation and change in the shorter term. Changes to parts of the building will be fast, medium or slow and elements are designed accordingly with services, for instance, exposed to view. The new SUB is first and foremost a primary home for student life at UBC. While spaces for the individual abound, the focus of the design was to make warm, vibrant and dynamic social spaces for collective life. These spaces are woven throughout all parts of the building on every floor. In addition to rooms like the Forum, the Great Hall, the theatre and club rooms, which are obviously designed for groups, virtually every hallway and stair is conceived of as a potential social space. Student lounges abound that are un-programed and available for informal gathering. Views onto the building’s informal social spaces abound and so the building itself is not just a microcosm of the city but also a vast theatre in and around which student life is lived and amplified. The intention of the client, the student Alma Mater Society, is that the life lived in the SUB is to be as sustainable as possible. Energy efficiency, a primary concern due to global warming, is approached firstly using passive design principles. The high performance building enclosure is free of thermal bridging, well insulated and triple glazed. The overall amount of glazing is moderate. External sun shading is abundant. The sawtooth roof orientates the skylights to the north to minimize heat gain while the unglazed south-facing slopes are home to a large array of solar thermal panels. Active systems include a lower temperature warm water heating system that draws its heat from the return line of the campus district energy system. Displacement ventilation with heat recovery supplies fresh air in the most efficient manner possible. These measures are just a few of the large array of energy efficiency strategies employed by a project that considers the energy impact of many of the projects smallest components and details. Water conservation is also significant concern for the project. A large underground cistern collects rainwater which is re-used for toilet flushing and irrigation. Low and ultra-low flow fixtures are used throughout the building further reducing the need for potable water from external sources. A small but perhaps unique idea included in the new SUB is the closed-loop food and food waste system that begins with food production in the roof level garden. This food is intended for use by AMS run food outlets in the building. Food waste goes to composting which is then used as nutrient for fertilizing the rooftop garden. The concept of waste = food gets a quite literal interpretation. 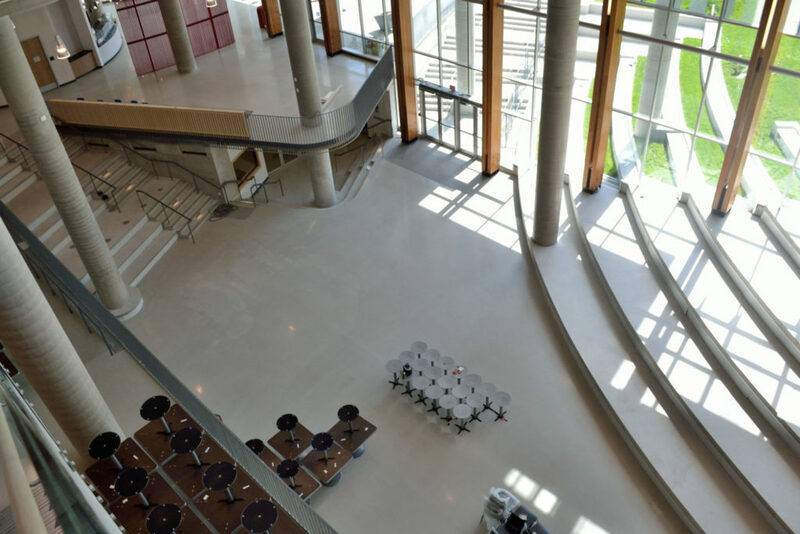 The new SUB is targeting LEED Platinum status and incorporates elements of the Living Building Challenge like the effort to eliminate as much as possible red-listed materials from the building. The building sees intense use with upwards of 5,000 people per day coming through the building; with this project we see ambition in sustainability in a heavy use building at something approaching an urban scale. 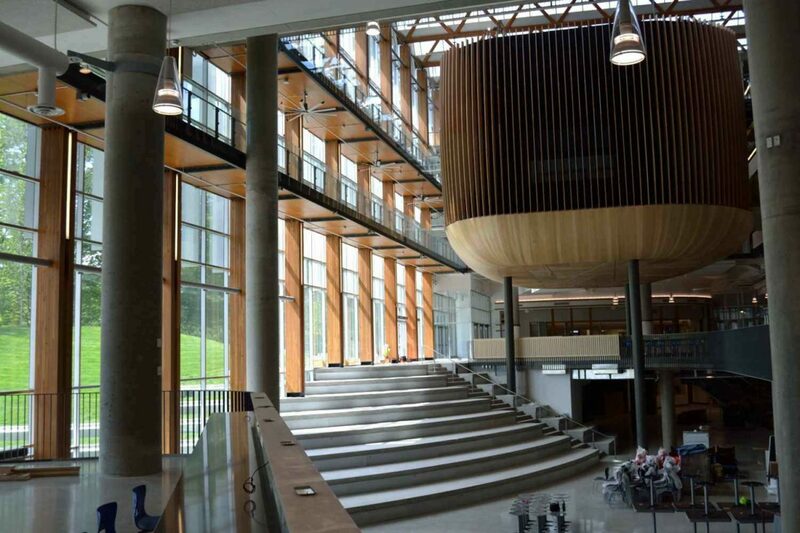 The new UBC Student Union Building, the Nest, is an ambitious project conceived of and begun by determined students, now largely graduated, who imagined a future for the student union, the collective student body, where people would come together in a warm, welcoming and sustainable environment. Like a small city or hill town, the SUB has a large and diverse program including government, institutions and food services that nourish its occupants both physically and emotionally. The design is structured around the many formal and informal social spaces that are linked by carefully choreographed spaces for movement. For the young patrons, it is imperative that their future, if there is to be one, has sustainability as a core goal. Posted in NEWS and tagged with UBC Student Union Building .